Where is Kingfisher Canyon Avila Beach? Where is Kingfisher Canyon Avila Beach? Kingfisher Canyon is located North of Heron Crest and Avila Beach and South of San Luis Obispo California in San Luis Obispo County. Mine Canyon is to the West, and Silver Oak and Skylark Meadow is to the East. The closest main road is San Luis Bay Drive off Highway 101. Directions from Highway 101: Turn West onto San Luis Bay Drive, then turn right onto Sparrow Street, then through the gate, then turn right onto Lupine Canyon Road, then turn follow Lupine Canyon Road about one mile, it will be onto your right. The following are the street names in this community: Lupine Canyon Rd, Shooting Star Lane, Buttercup Lane, Night Hawk Way, Goldeneye Lane, Foxen Canyon Lane, Rock Rose Lane, Loganberry Lane, Elderberry Lane, Tanbark Court, and Aerie Lane. 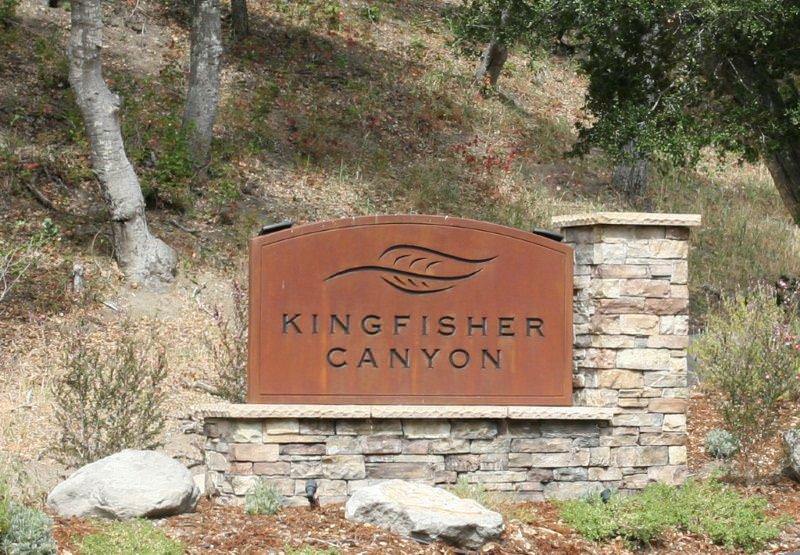 Kingfisher Canyon features 129 lots in this gated community. Where do these homes get their water? The homes get water from the San Miguelito Mutual Water Company. The current monthly fees are $41.66 for water and $47.97 for sewer plus water usage. More information can be found on their website. The homes are part of the San Luis Bay Estates HOA, and the monthly fees are around $. More information can be found on their website. Some homes have a view of oak studded rolling hills. There are many local activities including the Bob Jones Trail nearby, Avila Beach, Golfing at Avila Beach Golf Resort, and the Avila Bay Athletic Club & Spa. Residents of San Luis Bay Estates can get 20% off the initial registration fee. For more information go to their website or give them a call at (805) 595-7600. If you are a home buyer looking to purchase a home in the Kingfisher Canyon Avila Beach development, go to www.JamesOutland.net and search for Avila Beach home for sale. My IDX provider offers a simple clean way search for homes and I have received many positive comments. If you are a buyer who is very serious about buying a home in the Avila Beach Real Estate market ask me today about being set upon my portal for the latest active, contingent, pending and sold homes. This is a great buyer tool. You can sort listings and it’s always current and it delivers only the homes that fit your specific needs. Now to get started all I need is your search information sent to my email address [email protected]. It’s free to get on and you can cancel at any time, however honestly most buyers stay on the service so they can see what homes are selling for after they purchased. The service is also great for sellers who are looking to sell a home soon. If you own a home in Kingfisher Canyon and would like a current market valuation, please go to www.FreeHouseQuotes.com. This is a service offered to Avila Beach home sellers who are looking to list a home for sale in the next few months. This is a great seller’s tool to help compare what homes you could be completing against when you list your home. If you are insterested in new luxury homes located in San Luis Bay Estates please email me [email protected] for additional details. King Fisher Canyon new homes inventory is limited for a current list of availalbe homes please send me an email. My service area is Pismo Beach, Arroyo Grande, Shell Beach, Avila Beach, San Luis Obispo and beyond. I have sold hundreds of homes in San Luis Obispo and North Santa Barbara County.